Photo Effects Studio is a new program that will easily change your photos with the help of hundreds of unique filters. Professional photo effects are now available for everyone! Just select the necessary effect and enjoy the perfect result in a couple of seconds. The program allows you to add fantastic glows and fog, generate the effects of rain, snow, lightning and a starry night... You will be able to create the effect of an old photo, pencil drawing, mosaic, engraving, book illustration and much more. 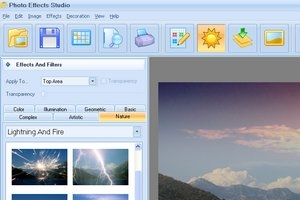 Photo Effects Studio also includes a set of unique filters, for example, poker-work, cubism and photomontage. You will also be able to make your photos more stylish with the help of frames and masks and also add text and decorations. The program includes a large collection of classic and modern frames to any taste. They will add a final touch to your composition. A lot of effects, the possibility of their combination and also the comfortable interface of the program offer you limitless freedom for creative work!